Because a change is as good as a cup of tea with some tiny tasty sweet morsels... this year the wonderful Alison at The High Tea Party decided it was time to give this all-things-feminine brand a breath of new life. We have loved working on this project and took it upon ourselves to recreate this identity to be one which inspired whimsical optimism in both the guests and the partners who loyally return to the Sydney, Melbourne and Brisbane events each year. We wanted to capture the experience of a day at The High Tea Party as being an escape from the everyday – where mothers, daughters, girlfriends and sisters could meet up, feel gorgeous and be delighted. The result is a collection of hand-drawn and softly collaged elements which come together to create a pretty, sunshiny new image. Their website is yet to be completely finished, but still looks great and you can see it here. To celebrate the makeover, tickets this week are only $65: check out their facebook page for more info. 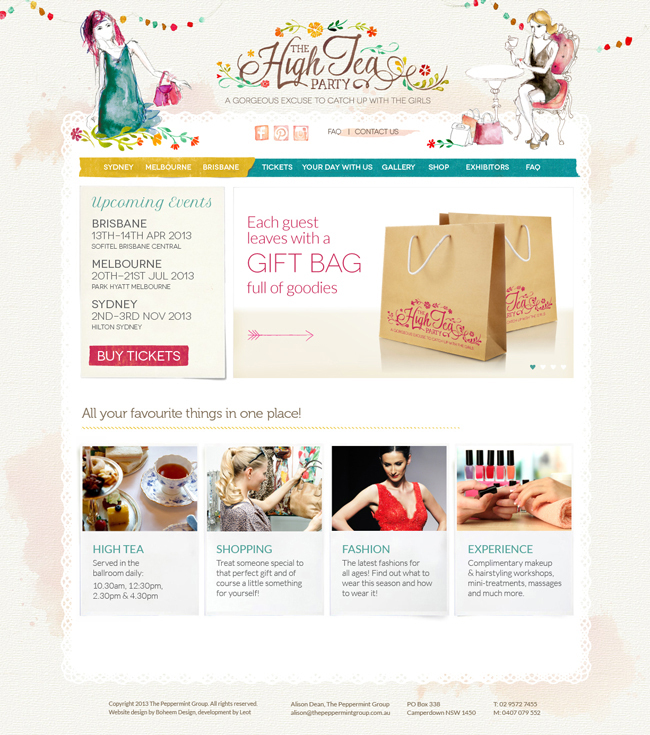 A definitely lovely website design!